This is the look I've been sporting since the Friday before Thanksgiving. I call it my Hillbilly Chic style. Paired with a baggy t-shirt advertising beer and some overalls - or perhaps just an old bath robe... it's the look every woman in Appalachia is wearing to special events this Holiday season. As much as I enjoyed learning to talk without moving my top lip so as not to reveal my imperfections... it's really nice to not have to be so self-conscious because am I an animated person. I've had to force myself to be very restrained lately and I've hated it! It didn't hurt but it was rough up against my lips. The really great news is that by changing to this dentist I am saving over $7000 - seven THOUSAND dollars off the entire treatment plan. Now I know that my absurd reluctance / anxiety to return to the original dentist was God guiding me to a much more affordable situation. I practically skipped out of his office today. Both dentists were genuinely nice guys. Both offices are lovely and convenient to our house. But that huge price difference is something I can't ignore. I am now very excited about finishing up the rest of my dental work in the coming year. I'll be offering up lots of toothy smiles on all my social media next year! In this picture I still had a bit of swelling from the numbing meds so I took another one to share with you. Please forgive my vanity but I am just so RELIEVED to have this tooth fixed! So... enough about me... 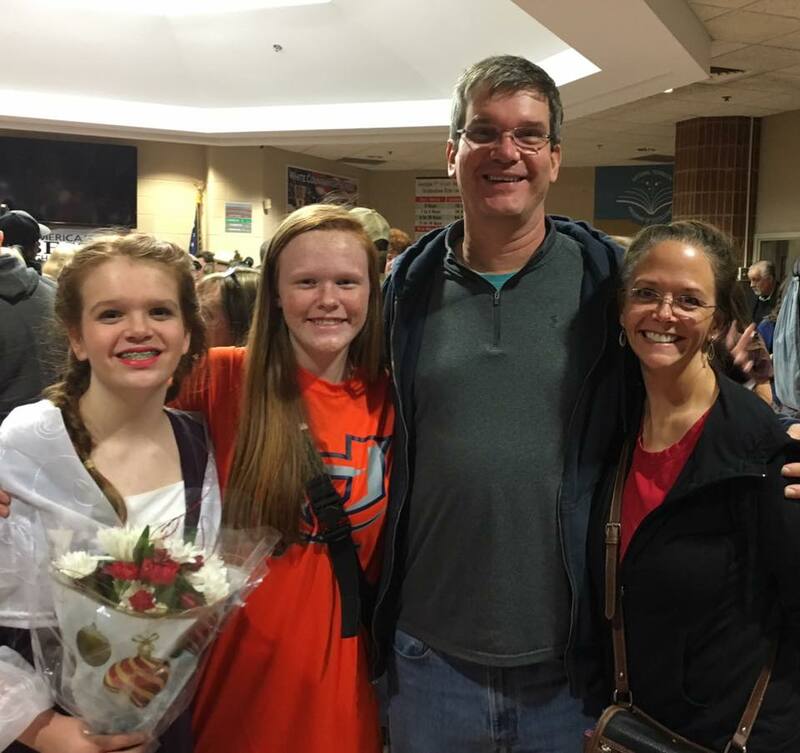 I wanted to share a few pictures from my niece Jamie's Beauty and the Beast - afterwards because, you know, flash photography in the show and all that. I snagged these off Facebook because I'm sneaky like that. 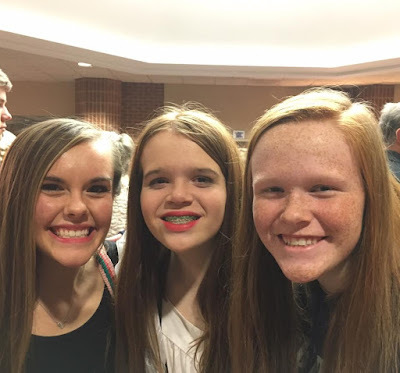 These three girls are among the finest, most intelligent, most talented and more importantly - have the biggest heart for the Lord in our little neck of the woods. They are going to change lives, mark my words! While their physical beauty is impressive... the beauty of their spirits is even more attractive and charming. I'm so proud I can claim even a tiny role in their lives! 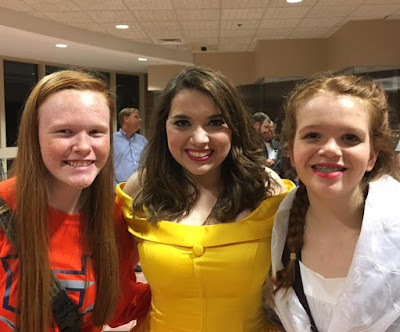 Haili played Belle (if the yellow dress didn't give it away) and she is also a woman after God's heart. I've been blessed to watch her grow in wisdom and grace and am so inspired by her! What a great role model for my nieces! Also, in case you missed it yesterday... Austin got a job yesterday! He starts Orientation and Training this weekend. He will be working for a pizza chain - Marcos Pizza - that is the first of that brand that we've had up here. He will be working inside the store but they are hopeful that he will be licensed soon and able to also deliver. Praying for much success for him in this new job and that things will work out exactly in God's perfect timing as far as driving... etc. It's been a great week so far! Happy Wednesday! Love and hugs, y'all! I wanted to share a few photos with you... some of these - almost all of them, actually - have been on my Facebook but I thought it would be fun to share the "behind the scenes" of some of them. First off... this sassy miss... performing all over the place. 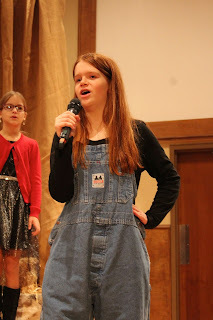 This photo is when she was in a Christmas program at church... then she sang with the adult choir at the lighting of the big tree in Helen... then she performed in a community production of Beauty and the Beast... which I ended up not being able to see. Due to other commitments there were really only two performances that would have worked for me. Both days were higher than average pain levels and I've long since learned that if I am in pain that I might as well not be there because I am in such a fog of pain that nothing, no matter how wonderful, can break through. I fell in the cat room last week while holding Cosy. I landed on a really rough homemade cat tree with lots of sharp angles, flat on my back while suspending Cosy in mid-air so that she didn't make contact with anything. She was fine. I screwed up a whole new part of my spine so that I'm having a painful numbness in my arms... all the way to my finger tips. I pushed through the pain to be able to take the babies to see my grandma on Saturday but that was the straw that broke this camel's back. By Sunday, my last chance to see Beauty and the Beast, I was miserable. Plus... and this is the bigger reason... my dad really wanted to see the show with my mom. He had already seen it once but really wanted to see it again so he could share the experience with my mom. Somebody needed to stay with the dog so I volunteered and I'm so glad they got to go together. I know every moment together is precious to them and I want them to have the opportunity to share as much life together as they can. I am so proud of Jamie. At 11 years old (12 this month!) she is fearless. She follows her dreams. She loves performing and she's good at it. It was a huge commitment to perform in Beauty and the Beast but she did everything she needed to do to make it work (including suffering through Pop's lame jokes while he drove her from her school in Habersham County to the school in White County where they held rehearsal... ha!) Sarabeth made the school basketball team this year after trying twice before and not making it. I remember the disappointment and frustration when I didn't make the cheerleading team at school for my 8th grade year but I wanted it so bad that I swallowed my pride and tried again for 9th grade and made it. I think when you have to work a little harder for something, it makes it more precious to you when it happens. Despite being really sick around Thanksgiving, she pushed through and played as soon as the doctor cleared her, even when I'm sure she still didn't feel great. . I love having a beautiful tiny miss in our lives now but these two were my first baby girls and I am LOVING watching them grow into two amazing young women. I am so blessed to share their lives! (Actually... my cousin Christie who was born the day before my 13th birthday was probably my first baby girl but you get the point). 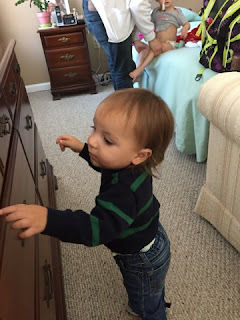 in this one Oliver is looking at some toys that Grandma has on her window sill. What you don't know is that Austin had fussed at Cosy earlier about touching the toys and Cosy is a RULE FOLLOWER! If her daddy says no... she minds him. She's got a bit of OCD going on and she really takes "no-no's" to heart. Austin is pointing at her because of the way she is holding her hands close to her and studying what Oliver is doing. 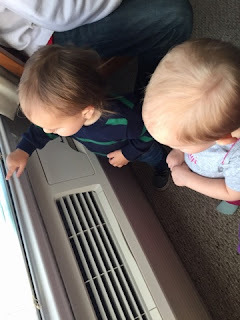 Then here... when Oliver's mommy got on to him and made him move away from the window... Cosy is still holding her hands close to her because she is NOT TOUCHING the toys. 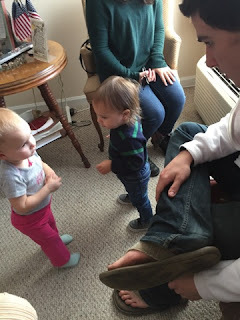 She's looking at her dad to see what he is going to say to Oliver since he touched the toys. We joke that throughout their lives Cosy is going to be the voice of reason for Oliver... "you shouldn't do that..." "I don't think that's a good idea... " You can already see it starting with them! she is looking at me. She's not irritated with him. She is pretty passive and tolerant and generally will let him do whatever as long as it doesn't involve touching a toy that she's particularly possessive of - mainly anything from Frozen. While we were at lunch Oliver was feeding her broccoli. He calls her "baby" and she calls him "Ol". This picture ... I love so much that I had it blown up to a large sized black and white. She's not angry... angry with Cosy involves whining, tears, drama, sometimes laying on the floor face down in protest... she lets you know when she is unhappy with a situation. So even though she looks like, "make it stop"... she really wasn't bothered. She was just letting Ol be Ol. And Oliver is looking at his mom to see if he is going to get in trouble. He's a curious little fella. They both are just amazed that there is another person around who is their size. 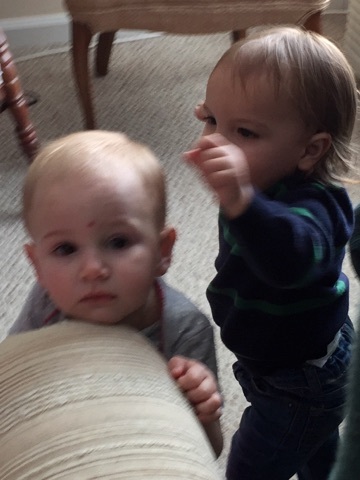 I can't wait to add my brother's baby - Finn, who is going to be right around 10 months old while they're here - to the mix. Finn is bigger than my babies and just beginning to be mobile. Finn LOVES bigger kids. I think we have lots of adorable moments ahead this Christmas! Finn doesn't have a social media presence so I'm going to have to be careful about angles but I will share whatever pictures I can of the three musketeers. I think these shots were before the all the other photos I've shared in this post. You can see that she is voluntarily in his space. It almost looks like she is holding his arm to keep him from touching the toys on the windowsill but I'm not entirely sure that was the case. But you can definitely tell that she doesn't mind him being near here, even if she looks a bit "over it" in the picture of his finger in her ear. See her hands? She is in full on "Keep my hands to myself" mode. She isn't one hundred percent compliant in every little thing... and her dad isn't necessarily strict with her but there are a few things he doesn't allow. #1 rule is nothing goes in the mouth but food and the pacifier. That rule is so deeply ingrained in her little spirit that I can whisper to her, "what does daddy say" if she starts to put something in her mouth and she stops. We are working on teaching her to share. The other day she got possessive with something and Austin took it away from her for a few minutes. When he gave it back she played a few minutes and then voluntarily gave it back to her dad without any prompting from him. We praised her and told her that was "good sharing". She's an only child and she's not around other kids much, other than in the church nursery and there aren't many kids there. She knows the word "mine" quite well! This was also pretty cute. Austin changed Cosy out of her pretty party dress because it has a lot of crinoline and is not conducive to comfy napping in a car seat. We had an hour and a half drive back home so we were hoping that she would get some good napping time in. While she's getting changed on Grandma's bed Oliver is exploring the room. Nosy Cosy in the background is fascinated with what he's doing. I have no idea why she's pointing to him. I probably said something like "where's Oliver" or... I don't know. I was in a good deal of pain as we had the long drive down and had gone to lunch which - I've been eating out a lot more than I did last year but it still stinking hurts every single time. I still end up taking most of my food home and having it later when I can be in my comfy nest. The pain from sitting makes me sick to my stomach and sometimes a little dizzy. 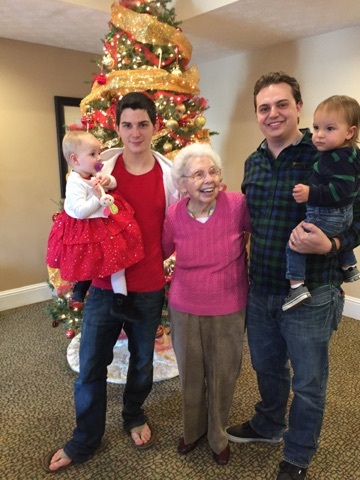 We couldn't spend as much time as we would have all liked with Grandma because Pop was in a show that night at church and Cody and Marquee had other commitments too. 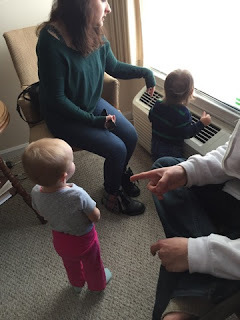 But we had been trying ever since Oliver was born to get both babies together with Grandma and he's 16 months... so, seriously, I was just glad we were finally able to make it happen, even if it was a short visit. 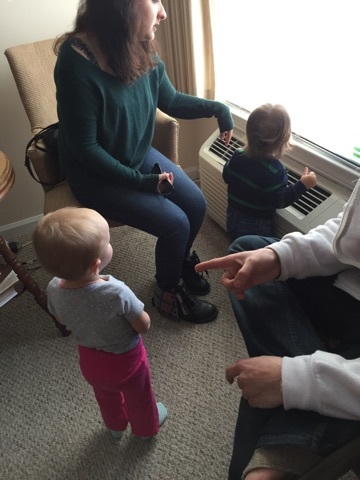 Also... my grandma is awesome but having two toddlers in her space has to be stressful! This is Oliver pointing to Cosy which is why I think I must have asked something goofy like, "where is Cosy". Can't remember. Pain fog and all that. I love this picture because... you know how usually if there are five generations living the oldest person is usually in a hospital bed or a wheelchair or looking like they're knocking on death's door. Not my grandma. 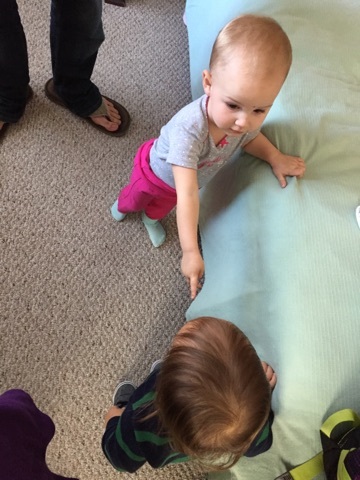 She's standing there helping to restrain our spunky little Oliver! (Marquee was there just in case grandma needed a hand). Fun fact - Oliver has TWO great-great-grandmothers living! One on each side of the family! This photo is precious to me for many reasons. I love that we ended up with Austin and Cosy matching and Cody and Oliver matching. I wanted the babies to both be in Christmas-y colors but the dad's matching with their babies was all them! Also... I have some good looking sons, don't I? 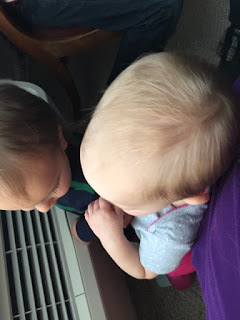 I posted two other pictures on Facebook of this little interaction between Cosette and her great-great-grandma... but this was also sweet because Cosy was genuinely interested in what Grandma was doing. Cosy loves to sit and look at pictures in photo albums. 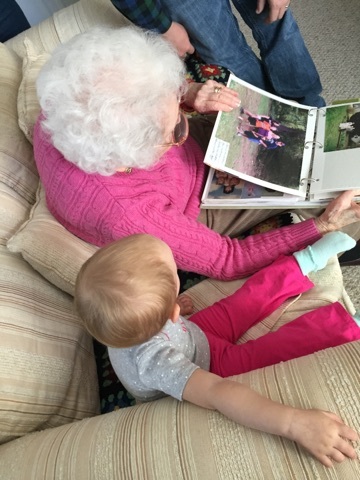 I prepared her for going to see "Our Leta" by showing her pictures of grandma. I used "Our Leta" with Cosy instead of "grandma" because Tasha's mom is Grandma to her and Cosy will rarely but sometimes want to see Mama/Grandma/Grandpa if we talk about them. It's only happened a few times but I didn't want to be in Woodstock - an hour and a half from home - and her decide she needed mama. Our practice has always been that if she wants her mama, we get her to her mama. We've done it that way so that Cosy doesn't worry about leaving mama because she knows that she can go back to mama whenever she wants. Cosy is always happy to go with us... and she is always happy to go back home. There are never tears during transition and it is important to me that she never has separation anxiety with any of us. I want her to be excited to be going wherever she is going. For that reason we didn't want to risk a "I want grandma" moment. I explained this all to my grandmother and she was fine with us calling her "Our Leta". There are so many photos that I DIDN'T get... I didn't take any pictures at lunch - we went to O'Charleys. I just wanted to focus all my attention on visiting with everyone. 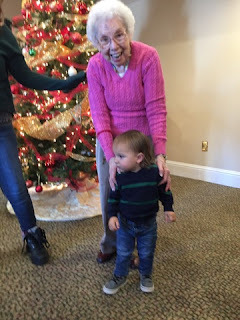 I didn't take any pictures of Cosy interacting with the folks who live at grandma's Assisted Living place although there were many opportunities! 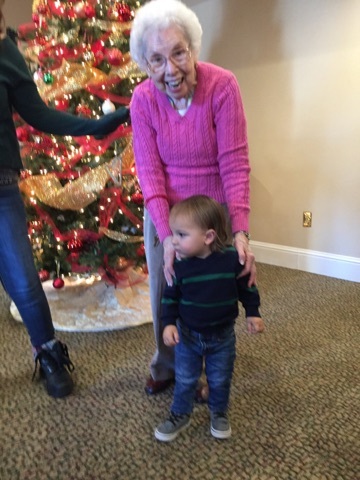 Bring a toddler in a fancy dress into a nursing home and trust me... you will become the center of attention! Cosy is used to it and will smile and charm whomever is paying attention to her. She won't let anyone else hold her (and I'm ok with that!) but she will play up to a crowd. 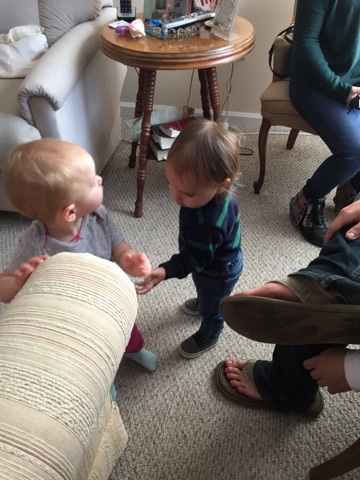 I also missed getting a picture when the babies kissed goodbye - melt my heart! Cosy has been warming up to Uncle Cody verrrrrrrrry slowly and finally - 19 months later - she voluntarily gave him a kiss. Still won't let him hold her... but that was a milestone moment for our family. One last photo to share for those who aren't following the dozen other social media platforms I use (exaggerating... slightly)... this was Cosette's visit to Santa last Tuesday. Hope you're all having a great week so far! Stay warm! Love and hugs, y'all! Ok, I'm only missing half of one but I HATE the way I look right now. I'm not a vain person. That's a lie. I'm vain enough that I put on eyeliner and mascara to drive my dad to the eye doctor this morning so I am a little vain. 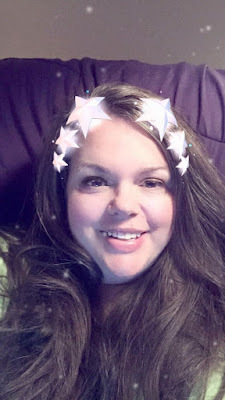 There's enough Southern Belle in me to never leave the house without at least a little lip gloss although I will admit to not being AS concerned about wearing makeup as I was in my younger/hoping to find Prince Charming days. I'm an animated person and it's impossible for me to talk and not show that gaping hole in my front tooth. This is one time I am looking forward to going to the dentist because I want my tooth fixed SO BAD! 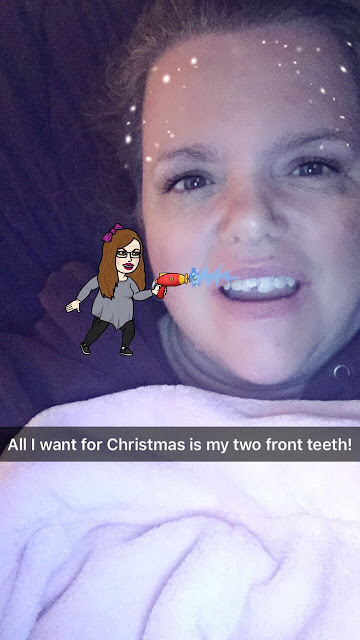 Since this is meant to be an actual wish list / gift guide... so you can make donations for my "two front teeth" with the Associates of Family Dentistry in Cleveland, Georgia. LOL! Just kidding... I've got this. 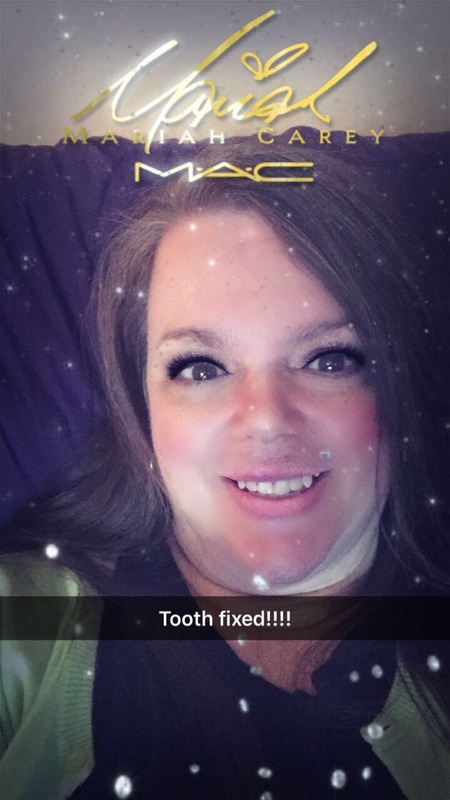 December 14th is my day to get "my two front teeth". Number one favorite gift for me to receive is CANDLES! Always a win in my Nest. 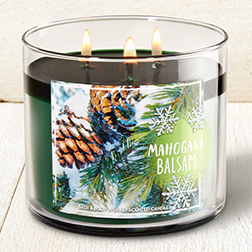 I love fresh, green scents like balsam and fir and evergreen. I am currently burning "mahogany balsam" from Bath and Body Works and it's very nice. I don't like syrupy sweet scents, anything to do with baked goods and things of that sort gives me a headache but I did have a lovely "warm apple pie" candle from Walmart last week that I really enjoyed. Our normal practice is to smell ALL THE CANDLES when we're at Walmart with Cosy. She's very particular about what scent can go in the cart with us and gives a definitive "no" head shake when what she's smelling isn't up to her standards. She's also mastered the concepts of "hot" and "don't touch" but if she's here I don't put the lit candles on my hearth, just in case. Toddlers are like mini drunk people and tend to be highly flammable. I'm also very paranoid of fire so... very careful with it. Number Two on my wish list is any kind of food gift basket. 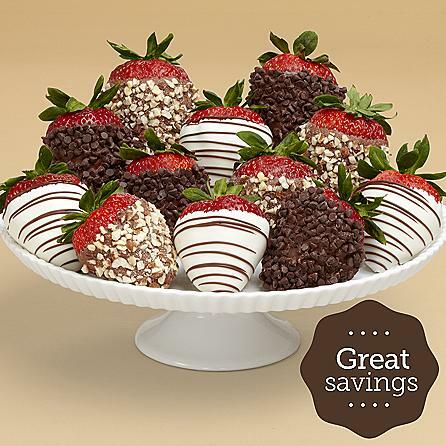 Shari's Berries are uh-mazing, I got them for Mother's Day once. I love the Edible Arrangements (even though I'm allergic to pineapple) and I'm keen on having one of those Hickory Farm's sausage and cheese combos any time of year but especially at Christmas time. Home made goodies are even better but I'm not connected enough with folks to actually receive those since I don't work. Sometimes a treat or two will make it's way into our Christmas brunch and I am grateful for every bite of fudge or divinity that comes my way. My New York sister-in-law has provided us with a spread from Zabar's in NYC the past few years and ... I have no idea of the cost but that is a fabulous gift for your Christmas Brunch. And for later in the day when you don't feel like making lunch. And for dinner. And for a late night snack. Seriously, there is no wrong time for bagels. I have come to associate Christmas with bagels now. Food for Christmas is the bomb-diggity. 3. Although I am not a big jewelry wearer, I am always happy to receive sterling silver jewelry. I'm not one of those ladies that has the big jewelry wardrobe with matching earrings and statement necklaces for every outfit. I'm the kind of jewelry wearer who keeps my jewelry on all the time and I only wear sterling silver because... that's what I've been able to afford. It fits my low-key/ low-maintenance style. I recently ordered the stackable Lisa Leonard rings with Oliver and Cosette's names on them (shared a few blogs back) and can't wait for them to get here! I wouldn't mind having rings with my kid's names as well. I also have a lovely charm bracelet that my parents got and would love to have additions for that. I know jewelry can be a very personal thing, taste-wise so maybe do a little detective work before making a big investment. For me... I like things that have some sort of sentimental meaning. 4. This might go in the food category but... I love getting tea as a gift. Right now I'm loving the Sleepytime Vanilla tea but I've always loved mint teas, chai tea, chamomile... most things except for things that have ginger in them. I also love tea "accessories" such as interesting types of honey, coffee mugs... and I collect teacups and teapots. The more unique the better! 6. I may be alone in this but I am always happy to get new photo frames. I really need to do some big prints of my favorite phots of my grandkids to add to my very barren walls in my living room. I also really enjoy getting framed photos. Again, the more unique the better. We are such a digital society now that we don't do actual physical photos much but I still love them. 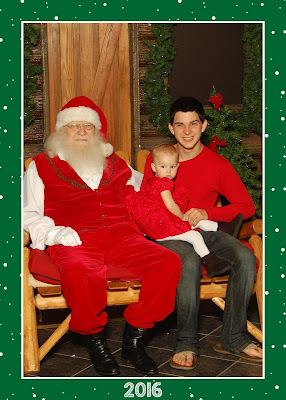 I bought a ton of Cosy's Santa pictures and have had so much fun sharing them! I forgot how nice it is to say, "here, stick a picture of this adorable baby on your refrigerator!". I also love refrigerator magnets because my granddaughter loves refrigerator magnets. Having framed photos and photos on the fridge has been a good way to teach Cosy the names of family members she doesn't see as often. She even pointed to a picture of Ryan yesterday and said, "Booboo?" Which... she has seen him maybe half a dozen times in her short life time... so that was exciting (for me). 7. Last on my Christmas wish list... and maybe a risky one for you to purchase for others... is clothes. I think my style is really easy to shop for because I love hoodies, leggings, long sleeved shirts... anything that says Nana, anything with Florida State on it... but I'm at a size that's hard to shop for because if you buy something way too big it's like... "do you think I'm THAT big?" but if you buy something too small it's like... "geez... I've got to admit that I'm even bigger than they think". It's also risky to buy clothes because your style may not be their style. However... the clothing items I've gotten in the past few years have been awesome... a beautiful purple jacket from my sister-in-law... a great plush robe (that I picked out for myself) from my parents... I've gotten lots of fuzzy socks which I love and honestly, I don't think you can have too many of. Basically, like with the jewelry, do a little detective work and think about their style. My niece likes a certain type of t-shirts so, although I would be super hesitant to buy clothing for teenagers normally, I was able to find the brand she likes and pick a color she likes and I think she's going to really enjoy what I got her. For myself... with hoodies... the bigger the better. With leggings... go for the plus size... and for any clothes, have a gift receipt available just in case. Or, if you know of a shop/website that your lady likes to frequent, give her a gift certificate for that particular place. So there you have my Christmas wish list / gift ideas for this year. It never hurts to just ask, "what do you want?". Some people are great - like my Cody who sent me an Amazon wish list which I followed exactly. Some people are vague so you have to get creative. Most of the people in my life have everything they want and need. I try to give gifts that someone might not buy themselves... or something that I know they use a lot (like me with candles and for instance, I got my grandma stationary because she does a lot of written correspondence - don't spoil the surprise for her, though!). Think about the person's lifestyle and hobbies... buying me fancy clothes would be a waste because I don't go anywhere that I have to dress up... buying me travel accessories would be pointless because I never go anywhere but for my sister-in-law who travels for work all the time, travel things are great! Don't be afraid of the staples - gloves, pajama pants for example but keep in mind the age and expectation of the recipient. For me, though, it's the thought that counts. It's not just a cliche. The fact that someone purchased something with me in mind and went to the trouble to get it to me means a lot. I'm not a material girl and I'm not the least bit greedy but everyone likes to feel important. I had a lot of Christmas as a single mom where there was nothing for me to open on Christmas morning and that's hard. 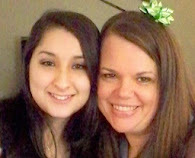 Fortunately I've had a lot more Christmases where I've been blessed beyond measure. Please keep our family in your prayers as my aunt is laid to rest tomorrow. After a long discussion with my mom today I realized that the best way for me to help her get through this time was to stay home and watch her dog Oscar. She was going to take him with us but that is a lot of time in the car for a little dog...a lot of stress for a dog who doesn't take well to strangers... and it's going to be really cold. I feel like I'm honoring my aunt the most by making sure her sister can be there without distraction tomorrow. She wouldn't leave Oscar that long with anyone else. So thank you in advance for keeping my parents in your prayers as they travel tomorrow and please pray for my cousins who are facing their first Christmas without mom. Love and hugs! SO now I'm apparently a weekly blogger... and I'm ok with that. I do daily updates on Snapchat but this has been a bit of a season of introverting for me. I do more "pondering" than communicating lately. Just a season of life I'm going through at the time, feeling all the feels. Here are a few highlights/things I can remember from the past week. The bronchitis is getting better, I think. I'm on day 9 of antibiotics and still coughing but not as bad. This is what bronchitis does in my body... sets up camp and refuses to leave. This is why I have a COPD diagnosis, although I'm obviously not walking around with a tank of oxygen or experiencing symptoms that many with COPD have. My doctor suspects that the undetermined autoimmune disorder is a disease called sarcoidosis. There's a lot of info out there about it but the first symptom is granulomas in the lungs. Mine were discovered 7 or 8 years ago. I have an appointment with a rheumatologist in January to follow up on it. I'm not really sure I want to see this doctor because his practice does not like to see patients with a fibromyalgia diagnosis. They were rather rude about it over the phone when I was scheduling my appointment. They aren't even treating me for fibro... I see the pain doctor for that. And it's quite likely that the symptoms that have been attributed to fibro are from sarcoidosis instead. I don't know. Just nuts. A new diagnosis probably won't change my quality of life but it will give my medical team a better idea of complications to watch for. Austin is still not working. He's discouraged. He's applied so many places, places that have help wanted signs and then they tell him they aren't hiring. I don't know what is happening. I'm afraid that Ingles is saying negative things about him when they are contacted to verify his work history. Please continue to pray for him as he wants to work - needs to work - and it's just so hard to find something in this small town. We had so many adorable Cosy moments last week! One blessing of Austin being out of work is that he has been able to spend a lot of time with Cosy. She's 19 months old now and just soaking up knowledge like a sponge. 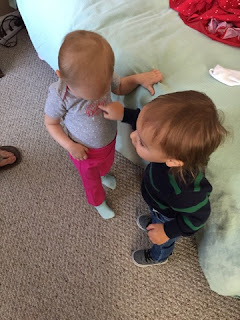 Last week she was trying to learn to work the zipper on her Sofia the First purse that she got for her birthday. She got so frustrated that she threw it to the side and crossed her arms and pouted in protest! It was hilarious. I took her into my lap and put my hands on her hands and we zipped and unzipped over and over again until she fell asleep. When she woke up the first thing she did was zip and unzip that same purse and she could do it! She is talking a lot more - although she is still more of a point and whine communicator. We are constantly trying to get her to say things and she is good to attempt. She loves shopping... I mean LOVES it! She loves makeup and jewelry and shoe shopping and clothes shopping and, of course, toy shopping. She loves "Maw" and gets excited when we pull into the driveway because she knows she's going to see her. I'm always exhausted when we take her home but I feel so blessed to have her spend so much time with us. I got busy on Saturday and wrapped lots of presents. 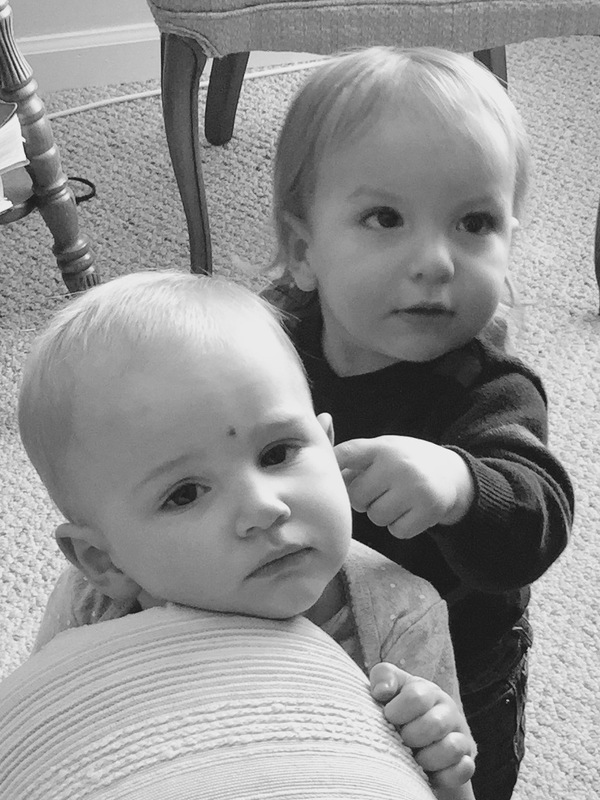 My favorite thing that I've gotten for the babies is Leapfrog's My Pal Violet and My Pal Scout. They spell and say the kids' name along with their favorite food, color and animal and lots of other things. When I went to program Cosette's name it was not in their database. They can spell her name but not say it. Oliver's name, of course, was in there. It's a much better interactive toy when it says their name. I tried Cosy and Cosette and neither one was there. I didn't think to do her middle name - Camille - and that IS in there so I'll reprogram it later. It's wrapped but it's just in a homemade gift bag so it's easy to pull it out and re-wrap it. I would rather use her first name but it's better with her middle name than no name. Maybe if I buy another of this type toy I should get it in France? Oui? Anyways... I found these for $15 at Walmart back in the Summer and when I went online to find one for my nephew Finn on Saturday (because I love them soooo much!) they were $30 on Amazon. Then I decided it might be better to get him something similar but not identical so there is no confusion. We are just entering the "mine" stage with the grandbabies. 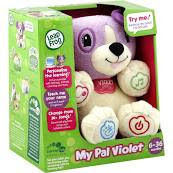 If you want the My Pal Scout or Violet toy, do a bit of online research. Target has it for $13 this morning and it's $42 at Walmart online. So... huge price difference! It's worth $42, for sure, because it really does a lot but if you can find it cheaper, why pay more? Anyways... end of toy talk for today. We had a really rainy day yesterday. We had planned to go see my niece Jamie in Beauty and the Beast but the cold damp weather ramped my arthritis into high gear. I could not move. Every step was agony. Sitting in a chair in the high school auditorium would have been absolutely impossible, especially since I couldn't take pain meds and drive. It makes me nervous because this is going to be a busy week and the next practical day for us to go is next Sunday, closing day. Friday is my Aunt's graveside service and Saturday we're taking the babies to see my grandma. Both involve a long time in the car which is misery for me but... Lord willing, I'll be able to get it all in. My mom's sister Linda, the baby of the family, passed away on Friday. She had been really depressed since her husband had died in 2013 and truly just gave up the will to live. She was diabetic and wasn't taking care of herself and it was just so heartbreaking to see her health decline over the past few months. She asked my mom not to come and see her during those last weeks and it was so hard for her but mom honored her wishes. She also didn't want a funeral, just a graveside service so that is what we will do. Friday the high temperature is forecast to be in the low 40's which is really cold for Georgia. We want to take the babies because it is a rare opportunity to be with family but we're not sure that we will take Cosy because of the cold. There is a building in the cemetery where Austin could take Cosy to keep warm during the service if he had to. We are hoping that we will have some gathering as a family before or after so that we can spend some time together. There is a viewing Thursday evening but that would be impossible for us to do - for me to do anyways - and we can't keep Cosy out that late. I wanted to write a whole blog post about Linda and I may do that later this week. Right now it's all so raw, one of those things that hits too deep to share at the moment. My mom's brother David passed a year or two ago but I barely knew him and had only seen him once or twice in my adult years. When Uncle Charles (Linda's husband) passed away in 2013, it was sad but he had suffered so terribly with cancer that we wanted him to be at peace. Linda was a huge part of my childhood, a huge part of my kids' childhood - as she owned a daycare that Austin went to in the Summer and her grandson Devyn was Austin's "best cousin". Losing her is the first loss of a relative that will truly impact our day to day lives so I'm still processing the emotions but I do want to share some special memories of her. All that being said, our house is decorated for Christmas. My mom is embracing the season this year. She was in so much pain from the pancreatic cancer last year and we truly don't know what the next year will bring for her health so we are eager to make merry as much as we can this year. I have sparsely decorated my tree because of the cats and the toddlers but it's still lovely. I have finished my shopping except for Ryan and Austin and have wrapped most things. I ordered a big shipment of stocking stuffers from Oriental Trading yesterday. (had a little problem with the shipping charges so I had to call their customer service and they were wonderful, just wanted to make note of that!). On Tuesday I have a doctor's appointment in Gainesville so we're taking Cosette to see "Ho-Ho"... which will probably be a picture of Austin holding a screaming Cosette as close to HoHo as possible but I'm looking forward to buying the biggest package of photos they sell so as to have photos to share with the special people in her life. My brother and sister-in-law are coming to spend Christmas in Georgia and I canNOT wait to see my nephew Finn! So... despite our sadness over losing Aunt Linda, we are celebrating this year in a big way and I know she would have wanted that. I guess that's enough catching up for now. I'll be posting on Facebook, Snapchat and Instagram as we go through our busy week ahead. If you want to see what's going on the FB is linked in the sidebar. My Snapchat handle is HGant5 and my Instagram is HeatherNancine. I'm on social media every day even though I'm not blogging every day. I'm out there, people! Hope you have a wonderful week and that your December is merry and bright! Love and hugs to all of you!